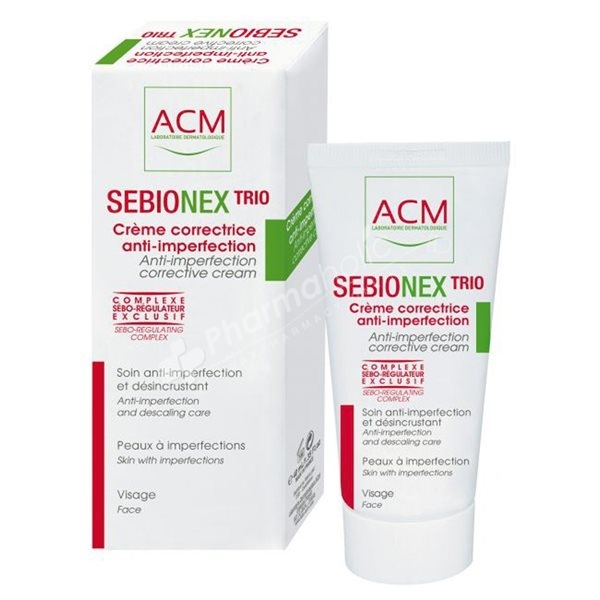 Sebionex Trio fluid cream has been specially formulated to mask and repair imperfections of young skin. Sebionex Trio cream has been formulated to reduce imperfections of the young skins with problems and limit their appearance. It associates in synergy mattifying, sebo-regulating, anti-bacterial, soothing and moisturizing active ingredients. Apply to clean, dry face every morning and/or evening. Aqua (Water), Glycerin, Nylon-12, Niacinamide, C12-13 Alkyl Lactate, Steareth-21, Butylene Glycol, Isononyl Isononanoate, Steareth-2, Cyclopentasiloxane, Isohexadecane, Glycolic Acid, Cyclohexasiloxane, Capryloyl Glycine, Lactic Acid, Zinc Gluconate, Salycilic Acid, Bisabolol, Biotin, Sodium Hydroxide, Stearic Acid, Polyacrylamide, Xanthan Gum, Propylene Glycol, PEG-150/Decyl Alcohol/SMDI Copolymer, C13-14 Isoparaffin, Palmitic Acid, Citric Acid, Sodium Benzoate, Sodium Chloride, Ammonium Hydroxide, Laureth-7, Chloroacetic Acid, Parfum (Fragrance).